Hank Pym as Giant-Man in Tales to Astonish #56 (June 1964). Hank Pym, the first Giant-Man, with the Wasp, appeared in many superheroes stories published in the serial Tales to Astonish and later, The Avengers. Bill Foster later became the new Giant-Man and the Black Goliath. In The Astonishing Ant-Man #4, Raz Malhotra debuted as the third Giant-Man and later became one of the supporting characters of the regular series, joining the Ant-Man Security Solutions of Scott Lang. Hank Pym was the original character named Giant-Man. He used that super hero identity after joining the Avengers with Wasp, Iron Man, Thor and the Hulk. He has also used other aliases like Ant-Man, Goliath, Yellowjacket, and Wasp. As Goliath, Hank Pym led the Avengers after Captain America left the team. He married his girlfriend Wasp and also created the artificial intelligence better known as Ultron. As Giant-Man, Pym fought villains like the Human Top and Egghead, and many years after, joined the Secret Avengers, the Avengers A.I. and the Avengers Academy. He also helped Wasp to escape from the Microverse after the "Avengers vs X-Men" conflict. Giant-Man also helped Matt Murdock and his friend Foggy Nelson on many occasions, and fought his enemy Ultron during the Rage of Ultron event. After seemingly dying during the final battle, Pym surprised everyone when he returned as an amalgamation of flesh and Ultron circuitry and encountered the Uncanny Avengers, later joining the team in his new cybernetic form as Ultron. However, the group didn't completely trust him and called the Wasp for help. After the Avengers' fears proved true and Pym transformed into Ultron completely and fought the Unity Division, destroying Iron Man's Hulkbuster armor in the process, the Vision was forced to help the team destroy his 'father'. However, Ultron was later revealed to still be alive. Bill Foster was Hank Pym's successor who originally went by the name Black Goliath. Foster later died during the Civil War storyline, where he joined Captain America's team as Black Goliath and was killed by Ragnarok. Raz Malhotra is a computer technician whose former field study was in artificial intelligence at the time when Hank Pym started to rid the world of them. Many companies shut down their A.I.s before Raz could graduate. He started working on a tech-support company called Techbusters in San Francisco. Upon resurfacing following his apparent death, Egghead read Raz's dissertion called "Breakthroughs in Moral Paradigms for Artificial Intelligence." Egghead decided to lure him into his lair under the guise of wanting support for his mac book. When Raz Malhotra arrived to Egghead's base, Egghead revealed his true intentions of wanting Malhotra to use his knowledge to power up artificial duplicates of the Avengers called the A.I.Vengers he had stolen from Hank Pym. Malhotra repudiated Egghead's evil intentions, forcing the villain to use a neural override device to control him. Egghead's plans attracted the attention of Hank Pym and Scott Lang. When Raz breaks free from the neural override, he shuts down the A.I.Vengers as Hank Pym knocks out Egghead. Some months later after Hank Pym seemingly perishes in the fight against Ultron, Hank Pym left one of his labs to Scott Lang who sent Raz a present in the form one of the Giant-Man uniforms. It was also revealed that Raz has a boyfriend. Raz decides to use the Giant-Man suit to fight Unicorn, but gets trapped in the Golden Gate Bridge during the conflict. Scott Lang later reunited with Raz and took him to confront Power Broker at his public promotion of the Hench App 2.0. They ended up coming into conflict with a female Blacklash who Power Broker hired to guard the event. Due to Raz's inexperience in crimefighting, Blacklash got away. 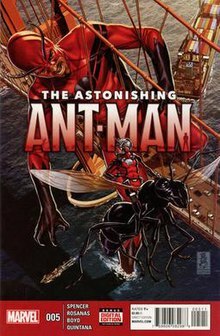 Following the incident, Scott Lang gave Raz an offer come with him to Florida to be trained while looking over Hank Pym's lab there. Raz accepted the offer. During the "Civil War II" storyline, Ulysses Cain later received a vision that tipped off Blue Marvel about Infinaut's ninth manifestation attempt enabling him, Giant-Man, and the Ultimates to work on a Pym Particle accelerator that ended up anchoring Infinaut and shrinking him down to human size. During the "Secret Empire" storyline, Raz Malhotra in his Giant-Man attire appears as part of the underground resistance against Hydra after they have taken control of the United States. When Hydra agents threatened his parents and sisters Preeti and Swapna, Raz Malhotra becomes Giant-Man where he defeats the Hydra agents and gets his family into the Underground. His fellow family members are unaware that Raz is Giant-Man. In the Ultimate Marvel universe, there is a group of characters called Giant-Men who gained size-shifting powers from a modified version of the technology that gave Hank Pym his powers and special jumpsuits that can grow with them. The Giant-Men are part of S.H.I.E.L.D. 's Reserves and consist of Scott Lang, David Scotty, Peter, Cassandra Lang, and some unnamed Giant-Men and Giant-Women. The Giant-Men and the Rocket Men join Nick Fury, Quicksilver, and Scarlet Witch into fighting the Liberators. During the Ultimatum storyline, the Giant-Men were seen saving as many people as they can after Magneto caused a tidal wave that hit Manhattan. The Giant-Men later carry the Ultimates away from the forces of Loki. The Giant-Men later attack the West Coast Ultimates and easily defeat them. Paul Rudd as Scott Lang / Giant-Man in Captain America: Civil War. Scott Lang / Ant-Man (portrayed by Paul Rudd) serves as the Marvel Cinematic Universe equivalent of Giant-Man; various interviews with directors Anthony and Joe Russo, Marvel Studios's head Kevin Feige, and Ant-Man director Peyton Reed confirmed this. In Captain America: Civil War (2016), Ant-Man grows in size during a battle between the Avengers. In Ant-Man and the Wasp (2018), Scott Lang goes giant when going after Sonny Burch's gang, becoming extremely fatigued if he is giant for too long. ^ Age of Ultron #10.A.I. Marvel Comics. ^ Avengers #60. Marvel Comics. ^ Avengers: Rage of Ultron #1. Marvel Comics. ^ Uncanny Avengers #13. Marvel Comics. ^ Ant-Man Annual Vol. 2 #1. Marvel Comics. ^ Astonishing Ant-Man #4. Marvel Comics. ^ Astonishing Ant-Man #5. Marvel Comics. ^ Ultimates Vol. 2 #9. Marvel Comics. ^ Secret Empire: Brave New World #1. Marvel Comics. ^ Ultimates 2 #6. Marvel Comics. ^ Ultimates 2 #9. Marvel Comics. ^ Ultimatum #2. Marvel Comics. ^ Ultimate Comics New Ultimates #3. Marvel Comics. ^ Ultimate Comics Ultimates #11. Marvel Comics. ^ Lussier, Germain. "How That Big Ant-Man Reveal Ended Up in Captain America: Civil War". ^ DiClaudio, Dennis. "Peyton Reed isn't thrilled about Ant-Man making the big time in the MCU". ^ JoBlo Movie Trailers (18 September 2016). "CAPTAIN AMERICA: CIVIL WAR - Giant-Man Featurette (2016) Paul Rudd Marvel Movie" – via YouTube. ^ Truitt, Brian (March 10, 2016). "Exclusive: Meet the biggest superhero of 'Civil War'". USA Today. Archived from the original on May 10, 2016. Retrieved March 10, 2016.